t*rexes and tiaras: Friday Favourites 090.. This week, I have to admit I rather struggled with finding a couple of things I'm wishing for. I've been mostly ordering new fabrics, sewing patterns and zips as I'm on a bit of a sewing roll, lately. I'm eager to take part in Me Made May, which is something I've fancied doing for the past few years, but didn't feel as though I had enough me-made items, until now. That said, these two have been bookmarked for a while and haven't yet made it onto here. 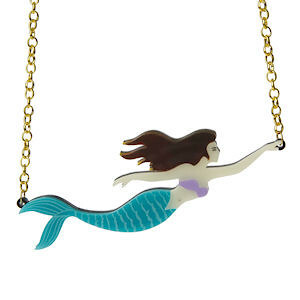 001: This mermaid necklace from Sugar and Vice is just fab. I love the bright colours. I'm a fan of some of the older Tatty Devine styles but the more recent collections haven't really appealed to me so much, so I'm glad to see some newer, much more reasonable laser cut jewellery brands out there. 002: This dress caught my eye in the window a couple of weeks ago and thankfully we were in a hurry, or else I would have gone in to try it on and no doubt it would be in my wardrobe by now. I think the embroidered flower detail is just beautiful. The net overlay makes it look perfect for weddings and garden parties, whilst the dark background makes me think it would be just as good when the seasons change and we head towards the colder months. Me toooo. Argh. I managed to restrain myself from going into the store at the weekend, which is probably a good thing. I need to clear out so that I have some space for new dresses. 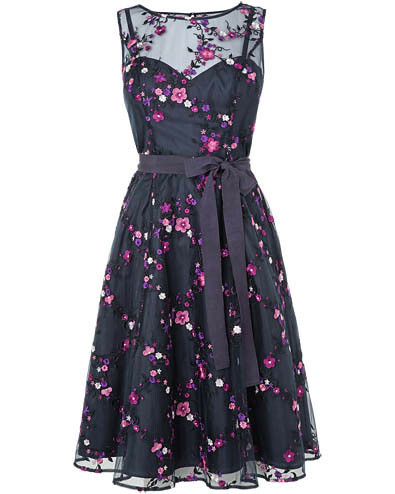 That Phase Eight dress is stunning!